Health and appearance transformations give our patients the level of care they expect today. While a Hollywood smile may be your goal, we know many people just want to feel better, eliminate discomfort, and enjoy the confidence exceptional dentistry provides. 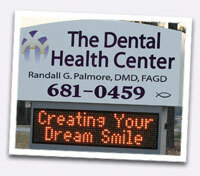 Each restored or enhanced smile presented on this website was transformed by Dr. Randall Palmore. Review what he has done for others and then schedule a confidential consultation and comprehensive health checkup. Use email form or call (205) 681-0459. Before: Metal expands and contracts, hides disease, is wedged into teeth, requires more tooth removal. After: Ceramic inlays and onlays, and white composite fillings are bonded to your teeth, which strengthens the remaining tooth structure and require less removal of "healthy" enamel. After: Transformation complete! Her smiling is now frequent with freedom to enjoy life a plus. Before: Worn and broken down teeth are very unsightly and can lead to further tooth loss. After: Renewed health looks like a winner and helps restore natural function. Before: Short, yellow, worn down teeth limited the expression of a fun-loving personality. 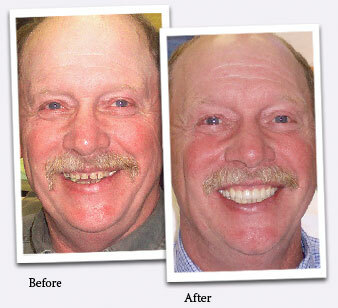 After: His restored smile has the health of his youth and has a feel he vigorously expresses! Before: This close up shows how severe wear exposes the potential for pain and fast decline. After: Dr. Palmore's expertise achieves perfect alignment and enduring health and comfort.